Joshua’s preschool is celebrating this day by letting the kids come to school dressed as their favorite community helper. We were informed to prepare for it a couple of weeks prior and I immediately knew what Joshua would be: An Engineer! 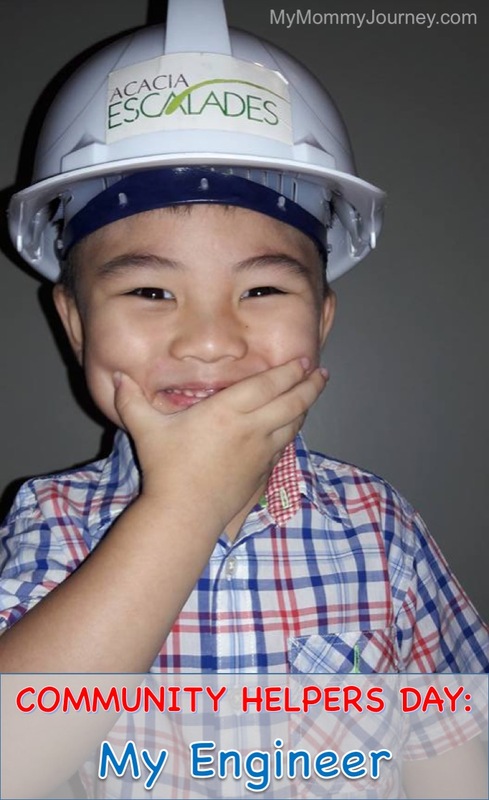 We have been “brain washing” Joshua to choose to become an engineer when he grows up. His grandfather, my dad, was a Civil Engineer and so is his cousin-guardian, Ate Binky. Hid dad, a lawyer, doesn’t want to encourage him to be a lawyer because he knew what kind of hardship he would have to go through like he did. Before you think we’re bad for trying to influence Joshua in a certain career direction, we did take into consideration what he liked doing. Well, it turns out he likes building towers, really tall ones, using his lego blocks. He also likes to build bridges and houses using his wooden blocks. He always points out building construction sites and is amazed by the cranes. Plus every time he sees a scale model of a building at a developer’s booth in the mall, he would always take a closer look. He would walk around the whole display and point out important features about it. Amazing! Of course, we are very open to him being something else entirely when he grows up. Some say he could be an actor because of his good looks and “dramatic” flair. Or he could be a doctor who specializes in heart surgery according to his dad (who had open heart surgery when Joshua was just 1 year old). Or if he had his way, he’d want Joshua to be a lawyer-engineer. What?! I opposed the idea because that would mean Joshua would be studying engineering for 5 years plus another 4 years of law. Poor baby! 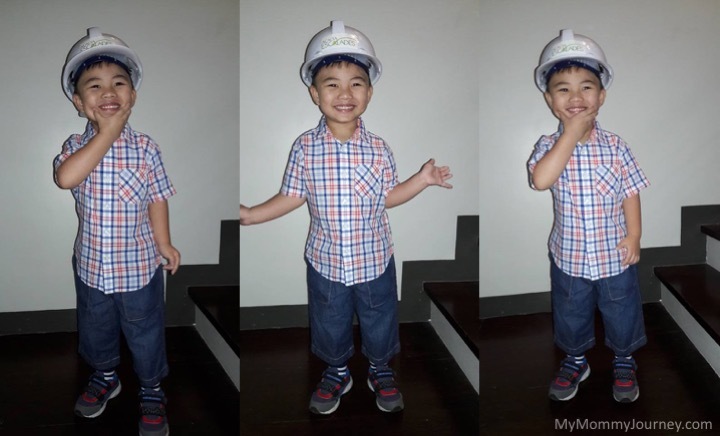 So the day before his school’s Community Helper’s Day, I already prepared his Engineer getup: blue jeans, checkered polo shirt, rubber shoes and his Ate Binky’s hard hat. Question is, would he be willing to wear it? Joshua is very keen on what he wears, he chooses his getup for the day himself. If he doesn’t like what you prepared, he’ll oppose it big time (A loud “Noooo!”) and go to his closet to choose his own clothes. So what’s a mom to do to ensure he wears his Engineer getup? Of course, he smiled at this and nodded. Whew! As I was toweling Joshua off after his morning bath, I again started on the psyching script. He smiled and agreed again, yey! So it was quite easy to dress him up after that. “These are an Engineer’s pants.” On goes his jeans. “This is an Engineer’s polo shirt.” On goes his collared shirt. Now you have to take note of one thing: Joshua hates wearing jeans and polo shirts! He usually only likes to wear comfy shorts and t-shirts. He doesn’t like the fabric of the jeans and says it’s too stiff and not soft like his shorts. Of course, a polo shirt with collar is more formal wear and he likes looking casual and comfy. So the “Engineer script” really worked this time, hooray! 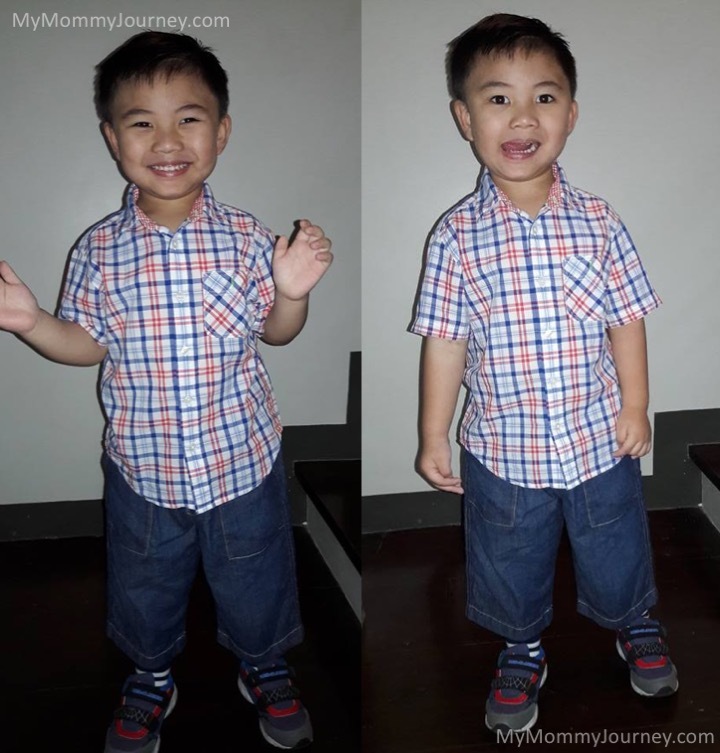 When we got downstairs at the ground floor landing, we took OOTD (Outfit Of The Day) pictures so he made a few poses. 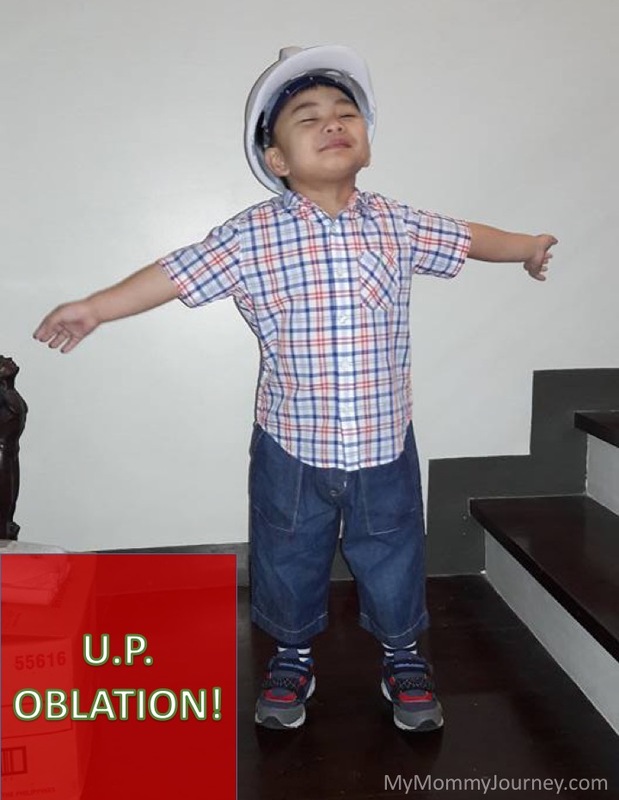 Then he stretches out his arms and looks up ala “Oblation” pose to copy the Oblation statue of UP (University of the Philippines) we had on the stairs display shelf. Cute! “You going to school in UP?” He nods. “You going to study to be an Engineer in UP?” He nods again. Haha brainwashing momma! Of course we want him to try getting into UP for college, not only because it has the cheapest tuition fees, but because of the prestige of studying at the State University. Plus it helps that all of us, including his grandparents, studied in UP so of course we want Joshua to study there, too. Since Joshua had his school bag, snack bag and hard hat to carry to school, I decided to just drive him to school. There was a bit of traffic because all 3 levels of Preschool were celebrating Community Helpers Day at the same time. I was mightily surprised to see that other kids were dressed to the nines. Their parents certainly made a “career” out of it. There was a fireman, complete with helmet and jacket; an army soldier who wore fatigues complete with a helmet; and an airline pilot who wore his uniform with tie, pilot’s hat, headset and complete with luggage to pull! Whew, it made me think of how simple Joshua’s costume was and was glad that an Engineer’s getup was quite easy. Now I know that Community Helpers Day in my son’s school is quite a big deal. It’s a chance for the kids to come in costume and the parents really strive to make their kid stand out. Hmmm goes to show how competitive the parents are haha! For me, what’s important is what my son will learn from coming to school as his favorite community helper. It doesn’t matter if he’s wearing the simplest costume. What matters is he learns to appreciate all the people who help in serving our community. Prepare early for whatever upcoming activity your kid’s school will be having. It helps to think and plan it so you won’t rush in executing it. It’s much better if you can borrow instead of buying materials/costumes needed. Or make them yourself! Your kids will appreciate it (and you) even more. Make a “script” to convince your stubborn 3-year old to wear whatever costume needed. Prepare him early into agreeing to wear it. Make it feel like he wants to wear it to begin with so he doesn’t feel forced into doing what you want. Brainwashing your kid isn’t so bad if it’s in the direction that makes his strengths shine through. But you only go so far as to planting the seed or the idea into his head. The final decision will always be their choice to make. Don’t be a competitive parent when it comes to your kid’s school activities. Your kid doesn’t have to shine (literally) among the rest. What matters is they learn the importance of the school event and learn to appreciate it. 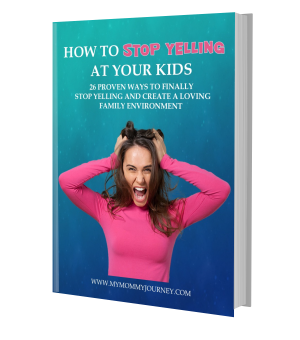 Are you a competitive parent? Do you “brainwash” your kids about their future? What community helper do you think your kid will be someday?